Sentez la fraîcheur de l'intérieur en pin qui est toujours fraîche en été et au chaud en hiver. La chaleur d'une maison en rondins surpasse tout le reste. La mezzanine supérieure avec la suite et la chambre à coucher s'ouvrant l'une sur l'autre avec une salle de bain attenante fermée bénéficie d'un magnifique éclairage naturel et d'un intérieur en placoplâtre avec plafond en bois rond, le tout ouvrant sur le balcon extérieur vitré du 3ème étage. Vous vous sentirez chez vous dès que vous arrivez. Basse salle de débrayage de jeu, buanderie et 3e zone de bain. "The cabin was trashed with food all over, wet towels on floors and furniture, sofa cushions off, all 4 beds were used (they only signed up for 2 people. They overflowed the jaccuzzi and called to tell me that water was running down the walls on level below. Cleaning crew have never seen such a mess anywhere." My reservation clearly says I reserved for 6 people. And I took a video right before we left, no food or trash all over, no sofa cushions off. There was still some trash in the trash bin that we didn't take out and towels on the bathroom sink but that's it! I paid for a cleaning fee before hand. I would think they could handle it! The home was beautiful and very clean! Great place to stay to spend time with the family while skiing at Boyne. We enjoyed relaxing by the fire in the evenings. Definitely recommend this as a great place to stay! Perfect winter weekend getaway property! 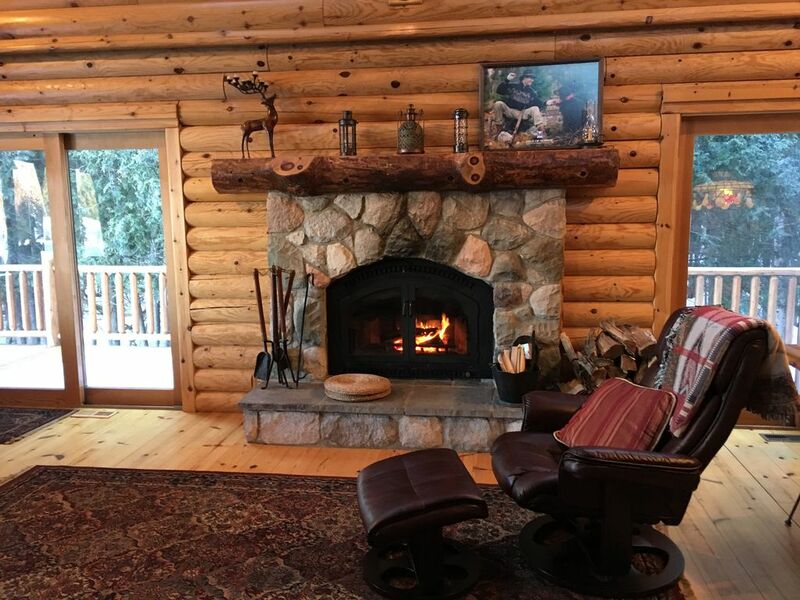 The entire process from working with Joanne on booking to spending the weekend in their awesome log home was great! The huge yard with the river running through it was a nice touch to wander around in the snow for a while. Super close to Boyne for skiing or tubing and plenty of room to sleep a couple of families if desired. We will definitely come back in the future! If you ever choose to return the security deposit is removed and there is a $50 discount. Wonderful place for a family to enjoy the Boyne area. We booked the log home for a 5-day New Years family getaway. We were extremely pleased with the accommodations and super-close proximity to Boyne Mountain. The kitchen and bathroom facilities were awesome. The basement with table tennis and air hockey gave our teenagers some breathing room. Belle forêt de cèdre sec butant contre la rivière Boyne le long de 220 pieds de façade pour paisible marche facile. Open in visualisation avant de terrain depuis la véranda à Rolling Hills à travers la route.